Miles repeatedly used "we" about Nebraska, where his son Ben plays. Having former Oklahoma State and LSU coach Les Miles on TV is producing plenty of notable moments. Miles made headlines for wandering around ESPN’s opening-night film room set looking for a restroom while still wearing his microphone, and now that he’s calling games for Fox, he’s making headlines there too. 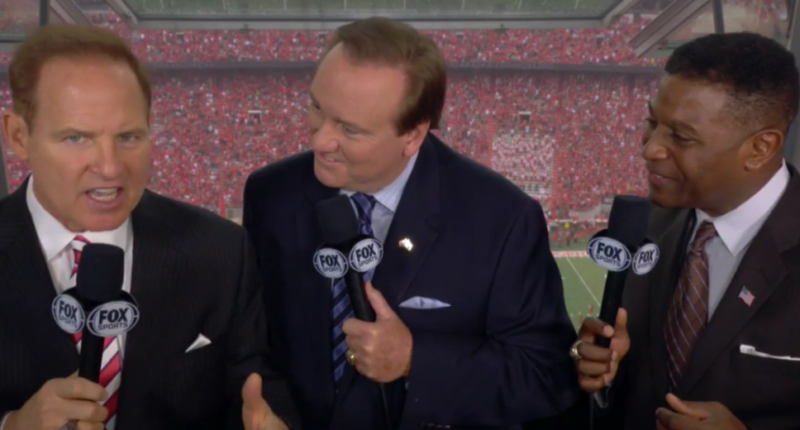 Fox probably didn’t want Miles to so openly root for Nebraska in the booth, especially with this happening time and time again, but Brando and Tillman handled it well, giving Miles some good-natured grief and explaining why his loyalties lie the way they do. And having analysts call their kids’ games is nothing new, even if they’re usually a little more subtle about rooting for them. Miles does deserve a little slack calling his first game, too, and it should be noted that he did have plenty of nice things to say about Northern Illinois, their players and their coaching staff as well (especially after their 21-17 win became official), so it’s not like he was ripping them up and down the field. And broadcasting curveballs are to be expected from Miles, considering his coaching career. But removing the repeated “we” uses (or just not assigning Miles to more Nebraska games) is probably desirable. At any rate, it made for another memorable broadcasting moment from Miles.